A clean light source has become paramount to the livelihood of low-income households in the country. Unfortunately, women like Prabhashini Rath still struggle to find easy and accessible lighting for their families without taking on huge debts. The expensive kerosene fuel is no longer a sustainable alternative to the frequent power cuts the families face in her village. Prabhashini is the woman pictured with her hand raised in the picture. She leads a group of women in the district of Kalahandi in Odisha. 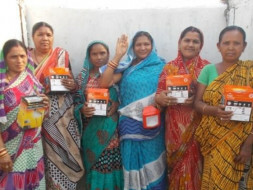 Milaap’s attempt to partner with Mahashakti Foundation to provide sustainable lighting alternatives to low-income families has started to bear fruit with an increasing number of women availing this opportunity. Prabhashini has formed a group called ‘Radhakrushna’ with 5 other women with the sole aim of using microfinancing to buy solar lanterns. Together, they are seeking a loan of Rs. 11,400 to bear the costs of the lantern upfront (Rs.1,900 each). With their monthly savings and increased productivity even during power outages, these women are confident of repaying the loan amount in full within 12 months. Let’s join Milaap in the campaign to bring light into the lives of these women. The Mahashakti Foundation (MSF) is a community-based microfinance institution that delivers quality financial services to poor households in rural Orissa. It was established in 2004 by founded by a group of professionals in Kalahandi, West Orissa.